Welcome, I am happy you found my blog. I am a passionate dancer and life time ballet fan who also is the proud mom of 2 girls who happen to take after the same passion. Guess what, this blog will initially talk about ... tutus, yes that's right. Oh ... before you read on and go exploring, please take my short poll on this page on your prefered kind of tutu. Hope to see you back soon. Picture above obtained from http://thedesigninspiration.com/photos/balletbird . Copyright please see author in the original source. By David Heuvel, the costume production director of Salt Lake City's Ballet West. Adrian Clarke's knowledge of tutus aesthetic and athletic pedigrees is said to be encyclopaedic. His skills and his ''The Art of the Tutu'' classes are rare enough to attract enrolments from as far away as Hong Kong and New Zealand. Well, it still is too far for me though but I would have loved to attend! It's the construction and history of these classic tutu styles that Clarke, costume designer and craftsman for ballet companies, film and television projects, author of six volumes on the subject and founding director of the Library of Costume and Design, will teach in three workshops at Melbourne's Kangan Institute from this month. September 21 to 29 - English Style. The earliest style, the Juponnage, he describes as ''long, flowing, almost a bridal look with an ethereal, floating quality.'' Its elegant composition of bodice, modesty bloomers and up to 16 layered skirts of mousseline or tulle, dominated ballets such as La Sylphide (1832) and Giselle (1841). ''Then, in the late 1870s, ballet changed, the tutu changed,'' Clarke says. The graceful, drifting movements of the Juponnage ceded to the demands of French choreographer Marius Petipa. '''Petipa started mixing in the physicality of Italian and Russian folk dances,'' Clarke says. He demanded his company kick higher, thrust wider, dance faster. The classic Russian and French tutus, increasingly shorter, tightly anchored by a second-skin basque and spring-coil boned corset, evolved, enabling dancers the freedom to perform Petipa's revolutionary repertoire. Clarke illustrates the beauty of a perfect tutu. Ayane Otsuka, 18, wears a classic Russian style in black, red and gold net and lace. Clarke fluffs her stiff, almost horizontal tutu, showing how its net tiers narrow onto the carefully fitted knickers. ''This suits Paquita and its quick, sharp movements,'' he says. Meg Royle, 15, models Clarke's English style in cream and gold. Its tutu skirts are slightly flopped and belled and move with a softer, slower bounce as she dances. Finally, with a few impossibly graceful steps from Les Sylphides, Sarah Mitchell, 19, demonstrates that ethereal, floating effect Clarke described earlier, of an ice-blue Juponnage. Video of tutu craft and classic styles with Adrian Clarke, Ayane Otsuka, Meg Royle and Sarah Mitchell. Swarovski will celebrate the revival of George Balanchine’s Symphony in C when the ballet is performed at the New York City Ballet 2012 Spring Gala on Thursday, May 10th in newly designed costumes sparking with Swarovski crystals. For New York City Ballet’s collaboration with Swarovski on costumes for George Balanchine’s Symphony in C, Marc Happel, the company’s director of costumes, stayed true to the original color palette while adding “a new kind of sparkle, a new kind of flash.” On opening night at the New York City Ballet gala on May 10, male dancers will wear black velvet tunics embellished with jet crystals, and the women, white tutus and a top layer detailed with a spray of stones. The sparkle will be head to toe: with jeweled crowns and fanned head dresses, as well as earrings by the former NYCB corps de ballet dancer turned jewelry designer, Jamie Wolf. Symphony in C, originally titled Le Palais de Cristal or Crystal Palace, is a ballet made by New York City Ballet co-founder and balletmaster George Balanchine to Bizet's Symphony in C (1855), which Bizet wrote at the age of 17 while studying with Charles Gounod at the Paris Conservatory. The manuscript was lost for decades, and was published only after it was discovered in the Conservatory’s library in 1933. Balanchine first learned of the long-vanished score from Stravinsky. He required only two weeks to choreograph it as Le Palais de Cristal for the Paris Opera Ballet. When he revived the work the following year for the first performance of New York City Ballet, he simplified the sets and costumes and changed the title. The premiere was on Monday, July 28th, 1947, in the Théâtre National de l'Opéra with the Paris Opéra Ballet where Balanchine was serving as a guest ballet master at the time. According to City Ballet docents the four movements were originally associated with and designed using the colors four gemstones, three of which Balanchine subsequently retained for the three movements of his 1967 ballet Jewels: Emeralds, Rubies and Diamonds. Even before the ballet was renamed Symphony in C, he had eliminated the color scheme and changed to the white costumes still used. The NYCB premiere took place as the final piece on the first performance, October 11, 1948, of the newly renamed City Ballet at the City Center of Music and Drama with costumes by Karinska and lighting by Mark Stanley. Jerome Robbins was in the audience at that performance and is quoted as saying that he immediately wrote to Balanchine asking to be hired in any capacity. 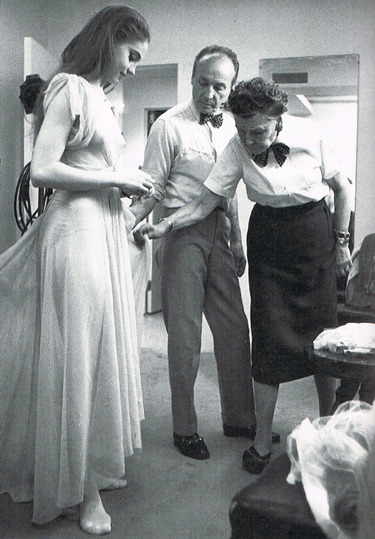 George Balanchine and Barbara Karinska fitting Suzanne Farrell for Don Quixote, 1965. Scanned from Costumes by Karinska by Toni Bentley. Suzanne Farrell says that Symphony in C is the first ballet she ever saw and determined at once to become a ballerina and join City Ballet. When she was in rehearsal learning her role from Balanchine, he asked her whether she could touch her knee with her nose en penchée, which she could, and this addition to the choreography remains to this very day. Symphony in C's original name Le Palais de Cristal makes it a perfect partnership for Swarovski. New York City Ballet’s (NYCB) Director of Costumes, Marc Happel, worked in collaboration with Swarovski to re-design the costumes for Symphony in C. The revitalized ballet will debut as the final ballet on the program at the 2012 Spring Gala. It was last performed by NYCB in 2008. The finale of the iconic Balanchine work features the ballet’s complete cast of 46 dancers, including four principal couples, and 38 Soloists and Corps de Ballet members. To accommodate the multiple casts of dancers that will perform the ballet this spring, NYCB and Swarovski created at total of 62 costumes, all embellished with Swarovski elements, including eight tutus for the principal women, 38 tutus for the Soloists and women of the Corps de Ballet and 17 costumes for the men. Over 105,000 hotfix crystals, sew-on stones and fancy stones in crystal, midnight blue, black diamond and jet, were used on the women’s tutus and men’s costumes. The variety of stones and crystals create a dramatic and intricate design on each costume, which glitter beautifully as ballerinas jete and pirouette across the stage. The design also features all new crystal tiaras and headpieces created by jewelry designer Robert Sorrell using Swarovski elements. The striking tiaras formalize each look as they rest upon the ballerinas’ heads. Former NYCB corps de ballet member Jamie Wolf, now a well-known jewelry designer, created original earrings, also incorporating Swarovski elements, which will be worn in the production. The earrings will be available for sale on Jamie Wolf’s website, with a portion of proceeds benefiting NYCB’s “Turn Out” fundraising program. “Swarovski is dedicated to supporting the arts and we are delighted to be a part of New York City Ballet’s revival of Symphony in C. Marc Happel has created elegant and alluring new costumes using Swarovski crystal for this major revival,” said Nadja Swarovski, Member of the Executive Board, Swarovski Crystal Business. “My vision for the costumes was to create an exquisite and memorable design while keeping them timeless and classic. It was a thrill to collaborate with Swarovski on this project. The crystals added a unique element to a traditional tutu,” said Marc Happel, Director of Costumes, New York City Ballet. The 2012 Spring Gala, sponsored by Swarovski and Christian Dior, will take place at Lincoln Center with a salute to France with the theme À La Française. Adding further brilliance and touches of spring to the event, gorgeous green and pink Blossom chandeliers by Tord Boontje for the Swarovski Crystal Palace Collection, will be on display at the event. The honorary chairman of the evening is Natalie Portman. Nadja Swarovski serves as a vice-chairman of the event. Joined on the program by world premiere ballets by NYCB Ballet Master in Chief Peter Martins and former NYCB Principal Dancer Benjamin Millepied, Symphony in C will be performed to a crowd of tastemakers at the gala event. Additional performances of Symphony in C will take place on Friday, May 11 at 8 p.m.; Sunday, May 13 at 3 p.m.; Saturday, May 19 at 8 p.m.; Friday, June 1 at 8 p.m.; and Saturday, June 2 at 2 p.m. Benefit-priced tickets for the gala evening, which include the a pre-performance cocktail reception, the performance, and black tie supper ball, are available through the NYCB Special Events Office at 212-870-5585. Tickets to the performance are available online at http://www.nycballet.com/ or by calling 212-496-0600. New York City Ballet’s 2012 Spring Season will take place from May 1 through June 10 at the David. H. Koch Theater at Lincoln Center. As with many Balanchine ballets, Symphony in C has no underlying story. It is a representation of the music by means of movement. Every single movement of Bizet’s symphony corresponds to a different choreographic scheme, with basic motifs and patterns for the corps de ballet; each led by a principal ballerina and a danseur. As such, the ballet has four movements, each featuring a different ballerina, danseur, and corps de ballet. The entire cast of 48 dancers from all four movements gather for the rousing finale. The Allegro Vivo (aka “Turn Key“): The movement consists of energetic dancing with quick-changing off-balancing positions, petit allegro steps and plenty of turns. For the ballerina lots of pirouettes in the variation; for the danseur a tall order of beaten jumps. The ballerina only stops to catch her breath when she pauses in arabesque between this or that jump. The principals and soloists join the mini-corps towards the end and for every supported pirouette the ballerina does, the corps answer with a combination of jumps. The finale has everyone executing a series of beaten assemblés, while the principal couple executes one last supported pirouette which goes into supported attitude devant once the music stops. The Adagio (aka “Bend & Snap“): Here the music is more lyrical and sentimental, so in several portions the mini-corps frames the principal couple (think Swan Lake Act II Pas de Deux) while they dance a Pas de Deux filled with lifts, balances and extensions; there are plenty of supported penchés, including the “nosedive into knee” made famous by Suzanne Farrell. As the music picks up mid-movement, the ballerina starts her variation. The section ends with the corps framing her again while she lets herself fall into her partner’s arms. Allegro Vivace (aka “Might as Well Jump”): The music becomes energetic and full of momentum. This section opens with the mini-corps - six girls and two soloist couples - grand jeté-ing across the stage. The main couple enters in a manège of grand jetés interlaced with single saut-de-basques and temps levée. They get to the middle of a triangular formation; everyone relevé-ing non-stop. The main couple fly off the wings, returning after soloist couples and corps have engaged in yet more jumping. Repeat. Leads enter for the last time, displaying bravura jumps, pirouettes and quick-footed steps, all the way back to front and then in diagonal lines. This section concludes with the corps kneeling and looking gracefully towards the audience while the ballerina is held in arabesque by her partner. Allegro Vivace (aka “Let’s Do What They Just Did”): In this final movement all principal couples join the fourth couple for an over-the-top display of technical prowess. It opens with the fourth ballerina going through a sequence of turns (many pirouettes & fouett ées), small jumps and changing poses, the corps moving around her. Her partner and two male soloists enter in blazing grand jetés and it all builds up from there. After the briefest of pauses as the fourth couple finishes their variation, all leads, soloists and corps de ballet join in. The ballet ends with all 48 dancers assemblé-ing in unison into a rousing finale; all principal ballerinas fall into their partners’ arms while soloist ballerinas are lifted in the background. Georges Bizet (1858-1875) is said to have composed his symphony while he was a 17-year old student at the Paris Conservatory as a class assignment. The score was discovered in the Conservatory’s library in 1933 (80 years thereafter), having never been mentioned by the composer in his letters and unknown to his early biographers. One of the theories behind it was that the piece had too many similarities to Symphony No. 1 in D (1855) composed by Bizet’s own teacher Gounod. Nevertheless, Symphony in C showed how gifted Bizet was as a melodist and orchestrator. Georges Bizet is best known for Carmen, one of the most successful operas ever written. However, he had more success in his lifetime with non-operatic works. He was an excellent pianist and wrote many pieces for that instrument, including Jeux d’Enfants. Many of the operas Bizet wrote, with the exceptions of Carmen and The Pearl Fishers, were destroyed by the composer or never finished. The full piece was first performed on 26 February, 1935 in Basel, Switzerland by Felix Weingartner. Certain motifs reappear in Bizet's later works as Le pêcheurs de perles, L’Arlésienne and Don Procopio. Premiere: 7 July, 1947 by the Paris Opera Ballet. Thêatre National de L’Opéra. Cast: Lycette Darsonval, Alexandre Kalioujny (1st Mov); Roger Ritz, Tamara Toumanova (2nd Mov); Michel Renaul, Micheline Bardin (3rd Mov) and Madeleine Lafon, Max Bozzoni (4th Mov). Premiere: 11 October, 1948 by the New York City Ballet at NY City Center. Cast: Maria Tallchief, Nicholas Magallanes (1st Mov); Tanaquil LeClercq, Francisco Moncion (2nd Mov), Beatrice Tompkins, Herbert Bliss (3rd Mov), Elise Reiman, John Taras (4th Mov). Like what you read? Then you can subscribe here! What kind of tutu do you prefer? My biggest passion is ballet - one that I share with my 2 girls of 8 and 10. I started ballet when I was 5. In the meantime I am also doing contemporary and jazz dance, and absolutely loving it. However, I seem to still be a little girl at heart, loving tutus and tiaras just as much as my girls. The Perfect Pointe Book by Lisa Howell CLICK HERE!